Toronto Storage Stadium owner Cliff Beaton (left) demonstrate just how much one of their storage units can hold at the storage stadium booth at the Home Show in the National Trade Centre, Exhibition Place. Students and those waiting for homes to be built, for example, have to find a place to store their furniture and housewares between academic years or until their new place is finished. But an eleven-year-old Toronto Storage company is aiming to extend not only its operations, but a message that moving to a smaller dwelling needn’t be a nightmarish experience. 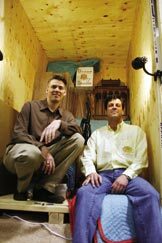 Cliff Beaton, owner of Storage Stadium, has tried to revolutionize the way people store their goods. He stresses Toronto’s Storage Stadium is not a moving company. Instead it focuses on the long and short-term storage of items in storage units in a warehouse facility – seems like an old concept until Beaton explains the system in detail. Where Beaton decided to make alterations on the old self storage idea was to bring the 1.52-metre wide, 2.13-metre deep and 2.44-metre tall storage units to customers’ homes. From there, customers can fill the storage units themselves, or pay a Storage Stadium employee to do the job. “The customer has total control over the price,” Beaton says. Clients can even bring their “stuff” to the Storage Stadium facility, leaving only the monthly storage fee to pay. According to Beaton, the concept is a simple one that he wanted to develop in order to meet customer demands that fell between the services provided by moving companies and self storage facilities. “At one end of the spectrum, you have the moving companies charging a fairly significant rate, handling the items several times, and we thought there was a significant market in between,” he says. The Toronto Storage Stadium concept came to Beaton when he learned of similar services in the United States that offer storage, but without manpower to pack the storage units or moving blankets to protect the contents. Besides the extra service options, the most important aspect of the concept for customers – who have unlimited access to their goods at the storage facility with 24 hours’ advance notice – is safety and security, according to Beaton. “The biggest thing that people like is that integrity factor. They see it going into the storage unit and they see it coming out of that same storage unit. They have that piece of mind that there won’t be any missing items.” That is why Storage Stadium is the premier Toronto self storage company.